I have a hankering for one of these as a second car for a bit of open air motoring in the summer months. I've found a low mileage 2.1d for sale, from 2012, which looks nice and is in my price range. Could any current/previous owners please enlighten me as to the pro and cons of owning one, the delights and frustrations of doing so, the costly side of it and the things to look out for? I'm keeping an open mind by considering other makes and models of two seater, open top cars, but I'm currently leaning in the direction of the Merc. My wife had the 3.2 version and used it for commuting. She racked up over 360 thousand miles with it and apart from usual wear and tear items ( alternator, bushes brakes etc) had zero issues with it. I thought it was a stunning car for everything apart from really long journeys such as the south of France and Spain, where we were in it driving for most of the day. Mind you, on the longer stuff i got sore buttocks as the seats are not sofa like and the suspension is firm. Any thing up to 3 hrs was no issue. I am 6'2" and had no issues with driving it or legroom. The fold down roof was in its own class and was superb giving you a good sized usable boot that you can get two full sized suitcases in. The gearbox was also superb and smoth as you like with the option of tiptronic change at the steering wheel. If you drive one you will see how good they are. Changing headlight bulbs was interesting unless you have multi jointed wrists and i had to take the wheel, then the wheel well liner off to change one when it went. We were changing tyres every 6 thousand miles, no doubt you could squeeze more out of them but we both like to drive and we did not spare the horses! Last edited by Carl.1; 10th February 2019 at 10:16. My wife had the 3.6 version and used it for commuting. She racked up over 360 thousand miles with it and apart from usual wear and tear items ( alternator, bushes brakes etc) had zero issues with it. I thought it was a stunning car for everything apart from really long journeys such as the south of France and Spain where. We were in it driving for most of the day and i got sore buttocks as the seats are not sofa like and the suspension is firm. Any thing up to 3 hrs was no issue. I am 6'2" and had no issues with driving it or legroom. Brilliant, many thanks Carl.1 - just the helpful sort of info I need to know! Wifey just told me i am a muppet...it was a 3.2! Did a quick edit about tyres and gearbox. Depends on your expectations, and what you want from it. As above solid car but a bit uninspiring to drive, if you want a well balanced great handling car for spirited b road blasts this may not be the one. If you just want some occasional top down fun and your not too fussed about the above then this will tick the box. If it’s a 2nd car is it wise to even contemplate a diesel? I’d be looking for petrol with a nice sound when the top is down? Errr it is a petrol! Had an old 1.8 that leaked like a sieve at the boot lid top and above the wing mirrors from the window. Changed seals etc all to no effect. Also had a 3.5 which was as dry as a bone and went like a train. One of the best cars I've owned. Mechanically the only problems I had was noisy fans on both cars which were easy enough to change myself and solved the problem. Look at getting a trickle charger as slks are heavy on the battery when not used and need to be kept charged. I'd buy another in a minute. SWMBO had a 250 and i ended up with it and in truth a nice easy car to drive the roof works very well had no issues in any respect all in all a good solid piece of kit really nice when the sun is shining do not expect s—- of a shovel performance but did me ok in leafy country lanes the paddles will not compete with a manual but can add to the driving experience. Just as an aside you need a full head of hair, a permanent tan and some chunky jewellery to complete the look. Last edited by mart broad; 10th February 2019 at 11:40. Fancy that, i was thinking about mine, they only made them petrol, did not realise they had now diesel models. I agree....go petrol, i would not like the smell of a diesel cat when sat stationary. As I’ve put on the years and lived with my little Toyota iQ for the past 7, I’ve generally become a relaxed old potterer in a car (although the iQ is remarkably capable and good fun in the twisty stuff), and get my adrenalin kicks when I’m out on the motorcycle now. The Merc will earn it’s keep relaxing and pottering in the sun! Thanks Mart, much as I had expected in terms of performance. I shall don a wig, plaster on the orange stuff and rattle the change in my pocket when I see the dealer - in case he refuses to sell me it otherwise! Lol! Great advice, I’ll look out for those points! Thanks alas58! Thanks guys, I would prefer a petrol for all the obvious reasons, but they are few and far between in my price range. This one ticks all the other boxes, so a bit of a compromise. Last edited by Itizme; 10th February 2019 at 13:14. Yep, agree with the S2000, however I don’t necessarily prefer Japanese. The iQ was bought purely because it was cute and very economical. Also because there’s only the two of us and it’s adequate for all our needs. Before that there was a couple of LR Discos, and 3 Mercedes saloons - so European is probably my preference, and even the motorcycle is German! I’m also pretty used to the hard, but extremely supportive seats in the Mercs, which I quite like! Thanks for the alternative choice however... not dismissed by any means! For pottering and relaxing in the sun, I can't think of many worse alternative options. A stiffly setup, high revving sports car with an old looking plastic interior. For what the op seems to be after, an slk is a vastly better option in every respect (bar residuals). Its got to work for you at the end of the day, your money your choice. Whatever you choose when the sun's out and roofs down it'll put a grin on your face, which is the end result. Yep but with his bike riding back ground the slk performance wise may leave him cold, I found it rather boring to drive.... But as my above post it's got to work for the individual. You're probably right! If one comes up with the right credentials I'd certainly be on it like a shot, as it would be my preference. Sadly there ain't many about, or so it seems up here in bonny Scotland! For what might be the right car I’d certainly be willing to travel? I live in NW London and I got my car from Manchester, my wife’s car from Oxford and my sons from Bristol. I ran an SLK55 for 8 years, i loved it. That engine is mental in a car that size. Not cheap to run though, 8 MPG on a track day! Generic SLK problems are few, I believe. The roof is ££££s to fix if it goes wrong but they rarely do. Early V6s can be affected by the well known M272 timing chain issues. 4 cylinder ones aren't particularly fast but probably enough for real world day to day. The diesel? Not my thing at all, and I think it was Autocar that said "competes with the Audi TT diesel for the title of world's most joyless sports car". But there's plenty of people on the Mercedes forums who are happy enough with them, and it seems 50 MPG is a regular thing. The diesel has a narrow powerband though, so you might find it swaps cogs a lot if you're "making progress". I found the ride OK even in the AMG, if you want to go around with the top down in cold weather make sure you get one with heated seats and the air scarf. I found the COMAND sat nav was rubbish although mine was a 2006 model so hopefully they've improved over time. Mine also had the Harmon Kardon stereo upgrade which was the best sounding stereo I've ever had in a car. Thanks Plug, terrific resume and very helpful! Understand re the diesel, however I feel there’s a big difference between the hyper critical opinion of a motoring journalist, and the real world of the man in the street. I remember motorcycle journalists at one time saying that the BMW boxer engined bikes only suited old blokes with pipes and slippers! I’m a world away from an AMG, but will keep an open mind at my lower end! Thanks again, Plug! I'm on my 5th SLK. Had a slk230K, slk350, a mental 352bhp slk32, back to a slk230 and currently a slk250 cdi. I think they are great cars, really under rated but suits my style of driving perfectly, ie lazy one hand one foot cruising and I've been all over Europe in one. The diesel does have the diesel rattle but it does not bother me in the slightest. I get 600 miles to a tank, 200bhp and the figure of 500nm of torque beats a E92 M3 V8! At nearly three years of ownership the car I have currently is the longest I've ever kept a car so that says something. I'm near Glasgow if you would like a drive of mine to see if you like before you buy with no pressure of the sale hanging over you. Just noticed you in Fife, I'm 20 minutes from the Kincardine Bridge, so you're probably not too far away. Hi Billy - many thanks for your very useful comments, but mostly for your extremely kind and generous offer to allow me a drive in your lovely car! I might well take you up on that! What a fantastic clock addition - love it! Will pm you in the next day or so. Yes, I'm an East Neuker, so very close by! Guys - thanks for all you help, advice, experiences and comments. All taken on board! All in all, everything I've read from you is very encouraging about the quality and reliability of the car in general, and your satisfaction with it. So, it all reinforces that the make and model is indeed right for me and is what I will go for! Keeping that mind of mine open, I'll still take a drive in the diesel, but try to also find a petrol version that I can drive and compare the two. I have been looking at all combinations and location for a while now and would indeed be happy to travel to find the right car. Thanks again, one and all, just shows how great this forum and it's members are! Isn’t the default answer to this thread ‘MX-5’? Nice car. Wife loved hers until someone smashed into the back of it. Had an approved repair done. Looked perfect. But got rid shortly after. That power roof is a work of art. But after the not insignificant shunt, we didn’t want to take the risk of anticipated roof problems. Understand it’s rather a complicated system. Just to comment on the command question... it’s still s&@t.
Haha! You’re right! I’m probably as surprised as you that it’s taken so long for that comment! Reasonable... but not for me! 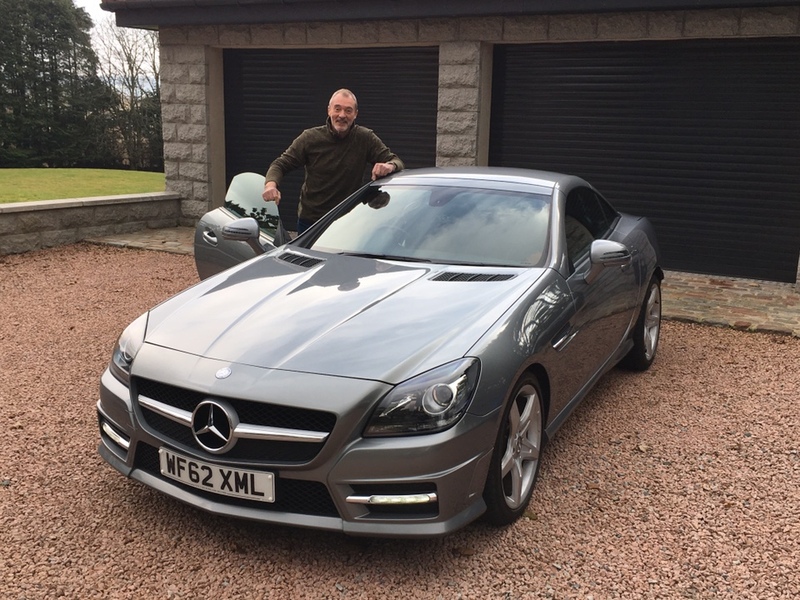 I drove a few SLKs when in the trade and thought the roof intruded on the boot space, I think they are more of a GT (long distance cruiser) than a sports tourer, if that’s what you want then they’re hard to beat, me, I’ll stick to my S2000, yes it can be a firm ride, noisy and the wind’ll ruin your hair, Woohoo. Thanks Pitfitter and I take your point re. the roof/boot, and you’re right, it’s more a leisurely GT I’m after. Enjoy your S2000 - I’d have no problem about having my hairstyle ruined, I could sort it out afterwards with a duster! Yep, the roof does seem to be quite a fantastic piece of engineering, and by default, complex and expensive to put right! When I had an Alfa Spider, I chose the manual hood version over the powered one for that very reason - less to go wrong, particularly as it was Italian! Well guys, search over and settled on an AMG 250cdi! The diesel won over the petrol in the end, for various reasons, not least of all for the tremendously torquey and low revving engine. 60mph is a relaxing, quiet cruise at around 1400rpm - I can cope with a bit of diesel rattle at tickover for that! Economy wins over the petrol, in both MPG (50+) and VED! Acceleration is certainly adequate and surprisingly brisk. The gearbox is lovely with almost seamless changes throughout the ratios, up and down. The ride on the low profile tyres and the (presumably) uprated suspension is a bit harsh around the wee roads in Fife, but smooth A roads/motorways are a delight. I love the very responsive steering and what has proved to be superb roadholding. The boot space doesn’t suffer too much when the roof is off, as only the height is compromised a little when the cover is in place. Happy chappy at the moment, so roll on summer, and long cruises with the wind in... er, on my scalp! Oh, and madam is particularly happy too! Winning! Thanks for all your advice, and as you can tell from my comments, all that you told me has mostly proved to be very true! Last edited by pinpull; 5th March 2019 at 19:27. Congrats exactly the model we had and it worked a treat in the leafy lanes of Hertfordshire just enjoy the ride. Should have bought the V8! Just kidding, horses for courses and as I said there's loads of happy owners on the Merc forums. Fingers crossed for a sunny summer! Enjoy..
V8 or not, you'll have some fun in that. Congratulations on the new car.It looks lovely (just like mine lol) and unless I'm mistaken it is Palladium Silver, one of my favourite Mercedes colours. As has been said before, treat it as a grand tourer rather than an out and out sports car and I'm sure you will not be disappointed. Mrs. B and I went to look at an AMG GT a couple of years ago, which just proved to be far to daft for us - the performance would have been thrilling but short lived (enjoyed in bursts every 12 months when we got our licenses back!). Parking was a nightmare and leaving it anywhere would have been an exercise in courage. It just so happened that there were three unregistered SLC's (the successor to the SLK - exactly the same car to all intents) on the salesroom floor when we were there, all were being offered with £10k off list as it was the end of summer and they wanted to shift them. The AMG was tempting but we rejected it due to the likelihood of license loss. We bought the AMG-Line 250d (a slightly darker shade of grey than yours, with a Night Pack) there and then, it was that good a deal. We, and by we I mean Mrs. B as it's her car, have been delighted with it - we wanted a toy and got one without the worries of the AMG, with a fraction of the running costs and enough driving enjoyment for us - we are very elderly (I hit 50 last year!) and have never been "competitive" drivers, although I do enjoy spirited performance. It's not a drivers car in the same way a 911 or an Elise is, but it is far better at crossing distance at a reasonable rate. We've had no problems but we have had enormous fun - enjoy yours! Thanks for your good wishes, mart, Plug, bambam and PhilT! Having fun already, so it can only get better! However, I take no responsibility for the 'summer' where you are... it will of course, be tropical up here in Bonnie Scotland! Lol! Thanks billymac! Seeing yours in that terrific colour provided quite a bit of inspiration in my search. I saw a couple of cars in just 'silver’, and they were incredibly plain and seemed anything but special! I shall indeed be touring in a grand fashion...! Last edited by pinpull; 7th March 2019 at 18:58. Thanks dickbrowne, a good read and a nice way to hook up with a car you're really pleased with! I can now relate to a lot of what you say, particularly the sinking feeling I get when the car's been parked out of sight for a while! I believe my car is in fact, AMG-Line just like yours. I couldn't handle a full blown, breathed on monster! The styling, colour and bodywork, etc, was what really appealed to me. Good to hear you've settled nicely with your SLC, and it appears your style of driving and expectation from the car is much the same as mine. Congrats for picking one up at that tremendous discount - right place at the right time! Continue to enjoy your car as well! Last edited by pinpull; 7th March 2019 at 18:34.